I love these little bears made by Lindsey Agostinelli. I hope the shop will have some more in the future. Making buttons is something I always intend to do but never seem to find time for nowadays. The Open sign needs replacing as it has grown so faded over the years and these little matchboxes - such fun to do but it seems like too indulgent to make some more right now. Yesterday I made three more tiny fairies and I've made a batch of clay fairies - some for tree decorations and some to go in fairy matchboxes. At this time of year there is so much to do to make the most of the run up to Christmas. Once my camera is working again I want to share pictures of all the lovely new decorations and gifts in Handmade Happiness. On Monday I will get a new battery charger as the old one still hasn't turned up. Then I can show you the lovely porcelain decorations Niloo brought in yesterday, Samantha Robertson's new ceramics, Sue Inglis' new Xmas gift wrap and new cards and decorations and a picture of the Christmas window. First I must find a real tree to put in the middle of the window. That's one of the things I intend to do today... Enjoy your Sunday. 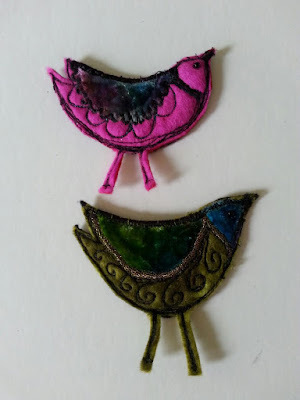 Today these lovely brooches arrived in the post. 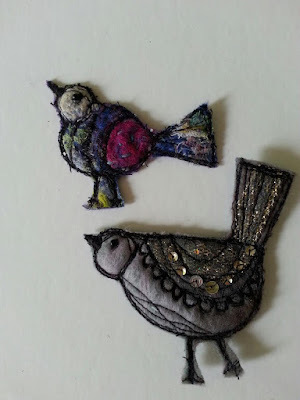 Bee Mellor, long time friend and a great artist, has made them using needlefelted and felted fabrics I've made. It's kind of a joint project but this time the bird designs are all Bee's own work. I love them. There are 11 in all and the cost is £20 per brooch. 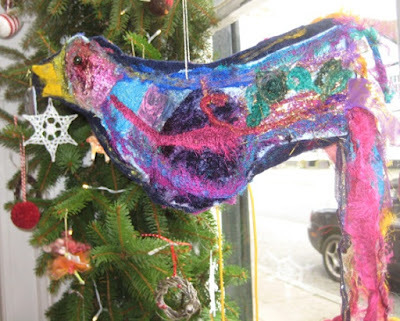 Come into Handmade Happiness to see the whole flock! You may even want to buy one for yourself as an early Christmas present! ps. I've been making bigger birds as Christmas decorations to put in the window.Once they are finished (one more of four to go) I'll do smaller versions for the tree. Pics to come. I love finding unnecessary decorative details on buildings and this wall and floor of multi-coloured tiny tiles is a joy. When it was made there was perhaps more time and money to pay attention to details and please the eye when adding the final touches. This week Handmade Happiness has had a delivery of new ceramics from Justine Jenner and the shop window has been transformed with greenery by Brenda Tilbury. On my day off I bought fairy lights. My only regret is that I didn't check them and the white flex shows up against the green foliage. Never mind the look is still pretty and the window is gradually transforming into a seasonal Christmas window. 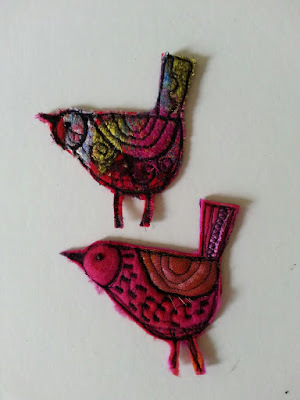 Today I'm hoping for a parcel from my friend Bee Mellor who has created some lovely bird brooches for the shop. 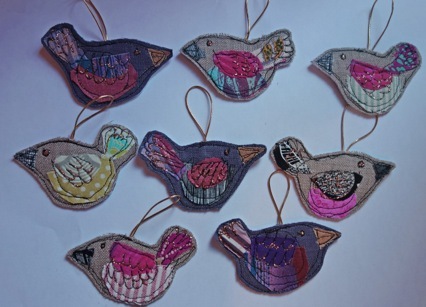 I've been working away on bird decorations which will soon be appearing in the window along with all the lovely handmade Christmas decorations created by Sue Inglis, Kate Hackett and Doreen Arnold.Decorations will combine with gift ideas from all the makers to make this year's window hopefully the best ever! I took this picture on my phone. The colours are much more intense in real life. The dolls cost £29 each. Please be aware, if you are thinking of visiting the shop tomorrow I won't be there in the afternoon and the shop will be closed from 3.30pm onwards. Exceptionally I'm having to close early in order to go to an appointment very sorry. I also need to tell you that I've stopped doing evening workshops for the time being. 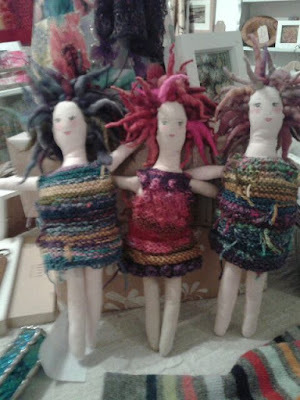 Maybe next year I'll do some workshops in the shop but working full time and then doing an evening workshop proved too tiring.